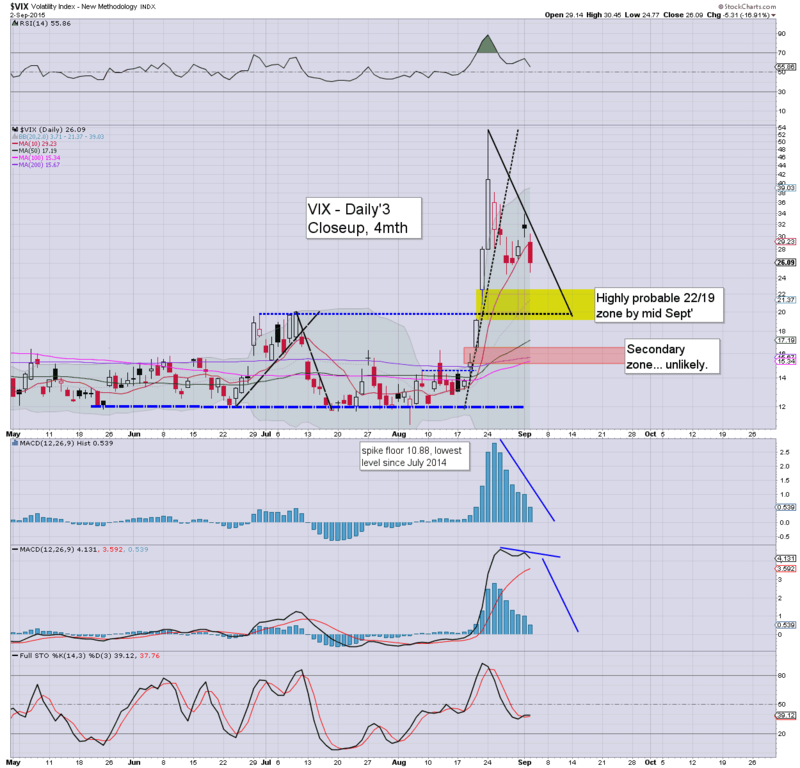 With equities closing with rather significant gains, the VIX was in cooling mode, settling -16.9% @ 26.09 (intra low 24.77). 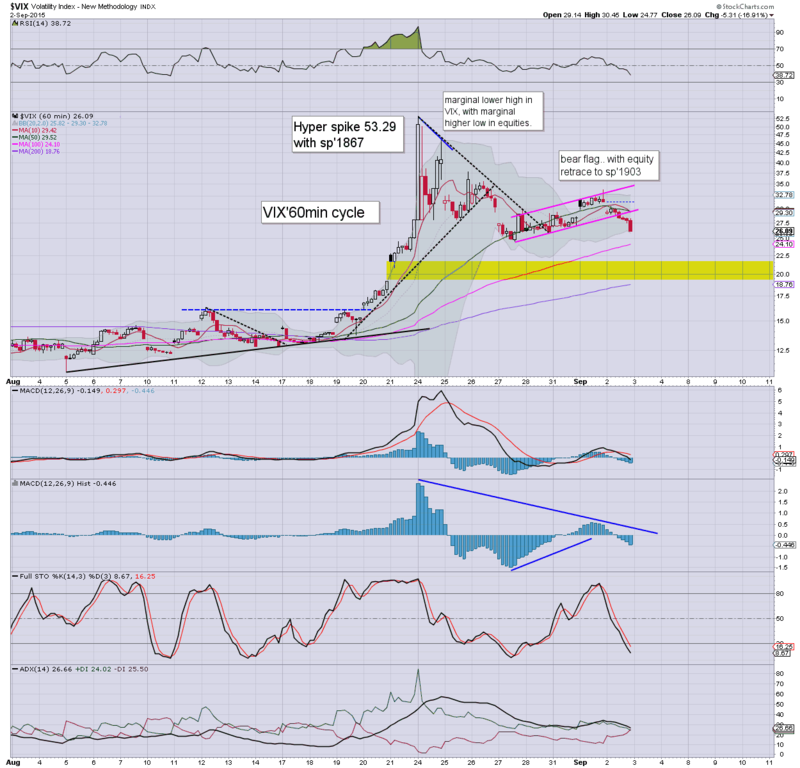 Price structure was a bear flag.. now confirmed, with further downside to the 22/19 zone within the next 10 trading days. Suffice to say, the VIX is on track... having confirmed the bear flag formation. 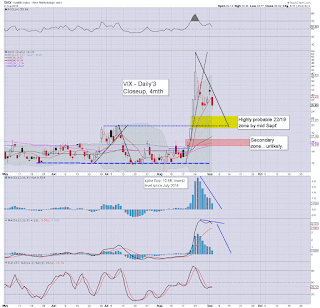 Further VIX downside to the 22/19 zone looks due, along with sp' back above the 2000 threshold. 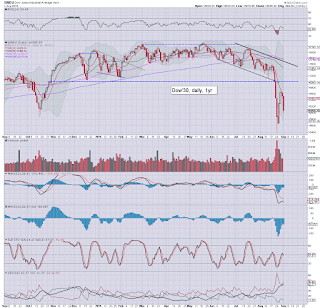 US equity indexes closed significantly higher, sp +35pts @ 1948. The two leaders - Trans/R2K, settled higher by 2.4% and 1.6% respectively. 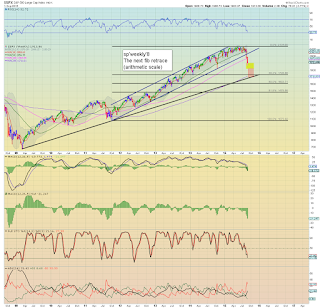 Near term outlook is for continued upside, with the sp'2000 threshold probable next week. *closing hour.. a fair bit of minor chop.. enough to spook some of the weaker bulls, but then a rather clear short-stop cascade in the closing 10 minutes... breaking new cycle highs. A pretty dynamic day.. a lot of chop.. but underlying upside. 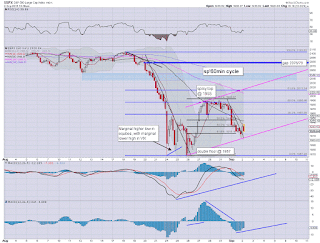 Market looks set to gap higher tomorrow.. the 1960/70s look viable. 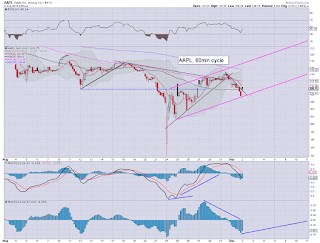 *I hold long-AAPL overnight.. seeking the 114/115s... before the weekend. Regardless of the exact close, US equity indexes are set for net daily gains, with the VIX -10% in the 28s. Outlook remains bullish into next week.. with the psy' level of sp'2000 set to be re-taken. 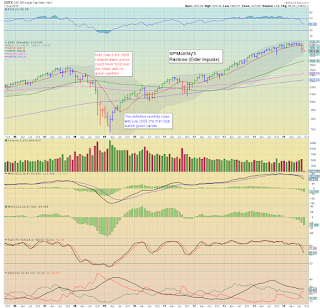 The only issue is where the market gets stuck... somewhere in the 2010/70 zone. 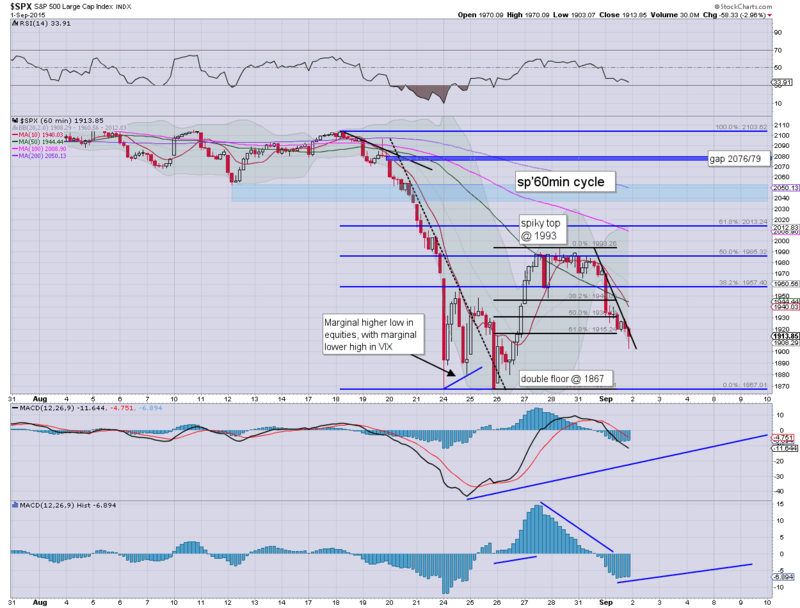 Despite continued concern from some that a retest of sp'1867 is due in the immediate term... I'm looking for further upside into the weekend... and beyond. *I will hold long-AAPL overnight, seeking the 113/114s tomorrow. US equities are holding significant gains, with the sp +21pts at 1935. 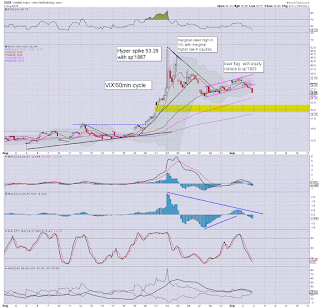 The VIX is confirming the move with a break under the bear flag... -10% in the 28s. 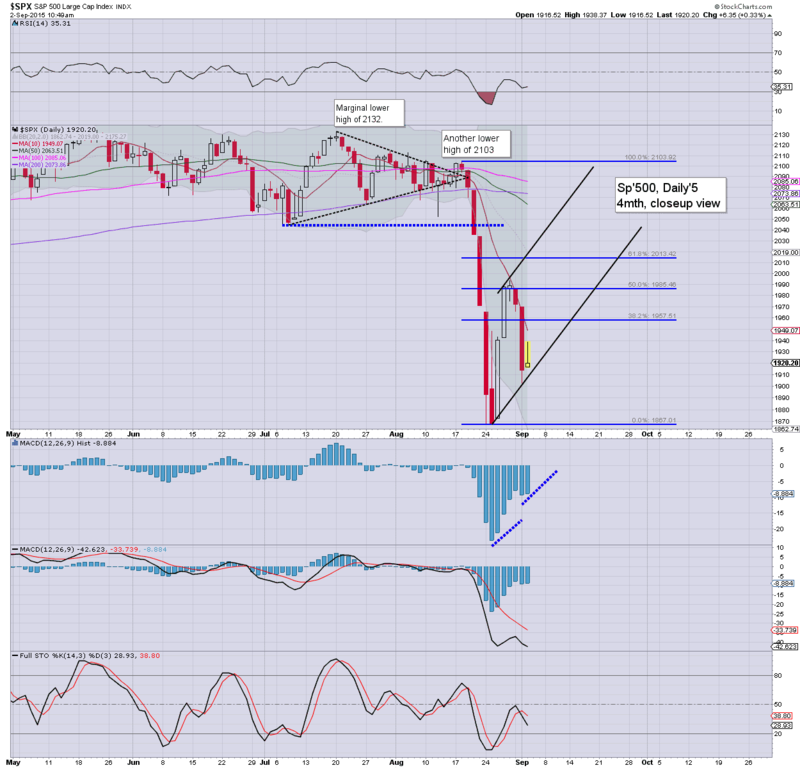 Further equity upside looks due tomorrow.. and broadly.... into next week. Ohh... but there is a Fed beige book due at 2pm... and maybe the Algos will use it as an excuse for a daily close in the 1940s... setting up 1960/70s tomorrow.. if the CEO of EU Print central pleases the market. So.. I've got the rainbows.. but where the hell are the unicorns? US equities are seeing renewed upside power, with the sp' +17pts @ 1931. VIX is confirming the calmer market, -9% in the 28.50s, the 22/19 zone looks a given if sp'2010/2050 zone by FOMC week. Frankly.. considering a 3 day weekend is ahead.. the setup really does favour the bulls. Yesterday sure does look like a particularly powerful retrace of the 126pt initial ramp. By default, I'd see the 1993 high being taken out... and somewhat higher from there. I continue to hold... seeking the 113/115s... before the weekend. US equities saw a morning pull back from sp'1938 to 1919.. but appear to have stabilised with a higher low.. and look set to battle upward for the rest of today. Certainly, despite the underlying weakness (that continues to increase), hourly/daily cycles are bullish into next week. Certainly, its not great for the bulls... but neither is it another train wreck. The bigger move should start on the back of Draghi tomorrow... and continue through the jobs data... into next week. NFLX -3.2% @ $102s.... somewhat surprising. *in the second pic, you can see a new tower appearing. Here in the NW part of London city, there are number of huge building projects that are set to span some years. I guess you could say bullish construction sector. For a few hours at least today, it almost feels like summer. US equities have notably cooled from the early high of sp'1938 - with VIX 29.03. Despite the cooling, the hourly/daily cycles favour the bulls into next week. 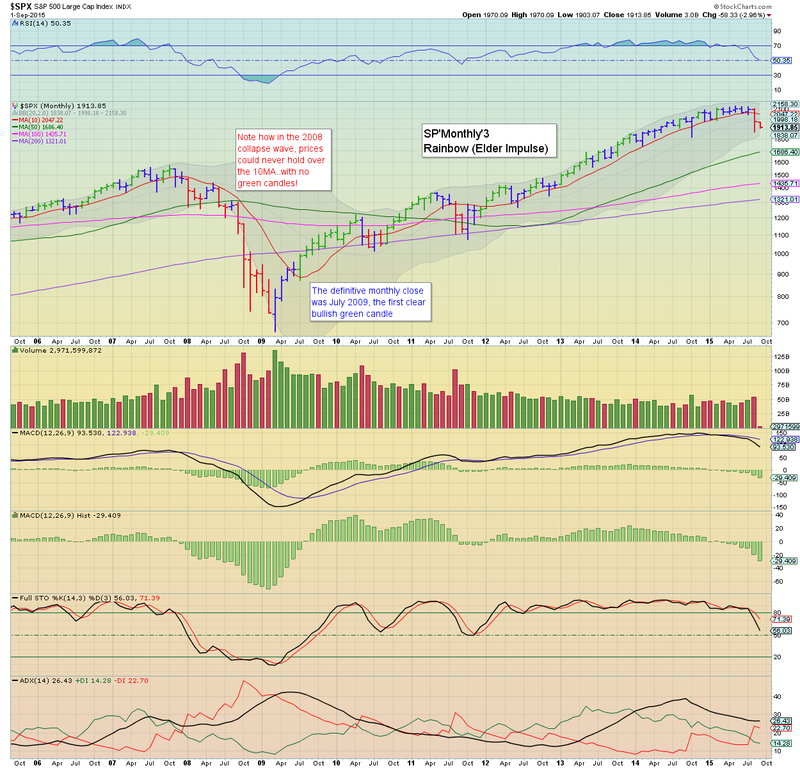 First target is last Thursday's high of sp'1993.. and then a prime target zone of 2010/2050.. with VIX 22/19. *daily candle sure isn't inspiring, but given the rest of today, I'd expect some of that spike to be retaken. Despite the moderate chop... and ongoing underlying weakness.... I'm holding to upside into next week. time for some sunshine... back soon. 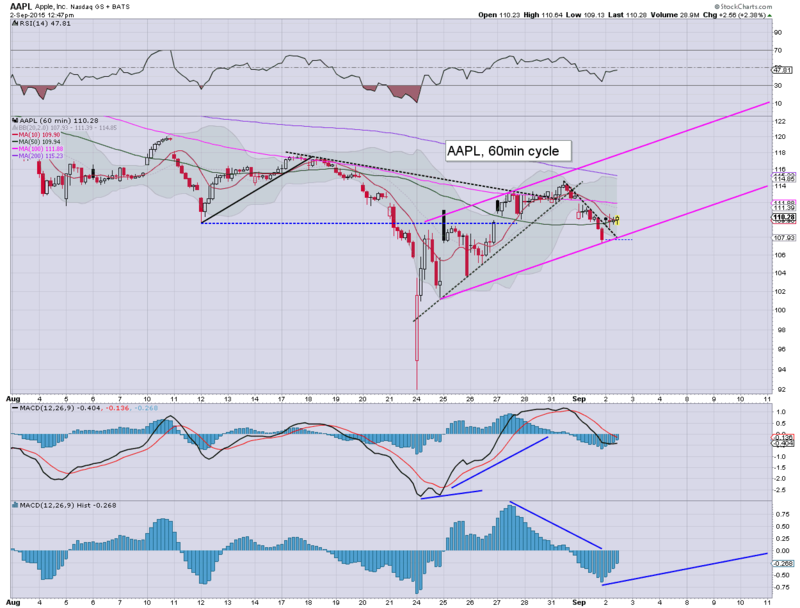 US equities are battling hard to pull up and away from the rather scary Tuesday afternoon low of sp'1903. 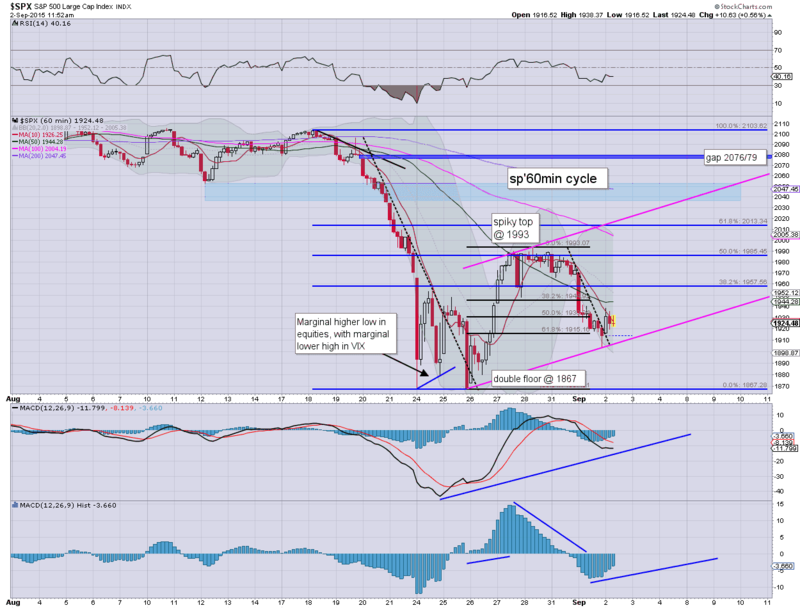 The hourly cycles are offering broad upside into the holiday weekend. VIX is naturally cooling, having already lost the 30 threshold. The 22/19 zone is viable before the next FOMC (Sept'17th). So... all those proclaiming a collapse wave yesterday are now getting ground out of the market. If Mr Market decides to interpret Draghi (ECB announce, 7am EST Thurs)... and jobs data as 'good news' then a weekly close in the 1970/80 zone is due. The 2000s look out of range until next Tuesday. 10.01am... Factory orders 0.4%... not exactly inspiring for the macro-bulls. sp +17.. 1931... so.. despite some chop... we're holding almost 1.5% above the Tue' low. Equities have seen a little weak chop.. but still holding moderate gains. Price structure favours the bulls. Good morning. Futures are moderately higher, sp +16pts, we're set to open around 1930. 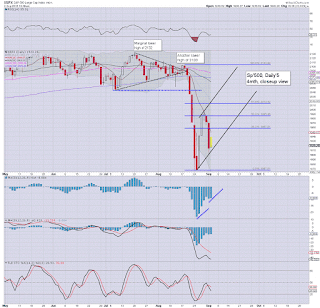 A daily close in the 1930/40s would bode well for the bulls, with further accelerated upside into next week. 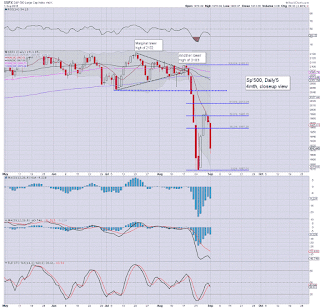 First target remains the big psy' level of sp'2000. So, we're set to open somewhat higher.... pulling up and away from the somewhat scary Tuesday low of 1903. I will want to see VIX under the 30 threshold today... and broadly cool to the low 20s next week. Overnight China action: Underlying weakness continues... with the Shanghai comp' -0.2% @ 3160. It seems likely there was some Govt'-buying into the close. *China is closed for the rest of the week for a WW2 anniversary. With the US closed next Monday... that arguably favours the equity bulls... as things can at least calm down into next middle of next week. 8.30am.. ADP jobs , 190k.. a touch light. Productivity, +3.3% annualised... thats rather okay... best level since Q4 2013. Unit labour costs, -1.4%... and that is bullish for profits! sp +18pts... 1931... VIX will be set to lose the 30s. Lots of data to come... Factory orders, EIA oil report (a big draw down sure would help Oil today.. and thus energy stocks/main market)... and a Fed book in the afternoon. notable strength: AAPL +1.7% in the 109s.. NFLX +2.4% in the 108s. On track for sp'2000.. with VIX 22/19. After a very significant net daily decline for the sp'500 of -58pts @ 1913 (intra low 1903), the big question is whether today was merely part of the expected retrace of last weeks hyper-gain of 126pts... or day'2 of a down wave that will take out the recent double floor of 1867? *its been a long day.... so I will keep this relatively short. As for the question... I am indeed still guessing this decline from the Thursday spike high of sp'1993 to today's low of 1903 is a retrace (if a very powerful one). re: chart'8. 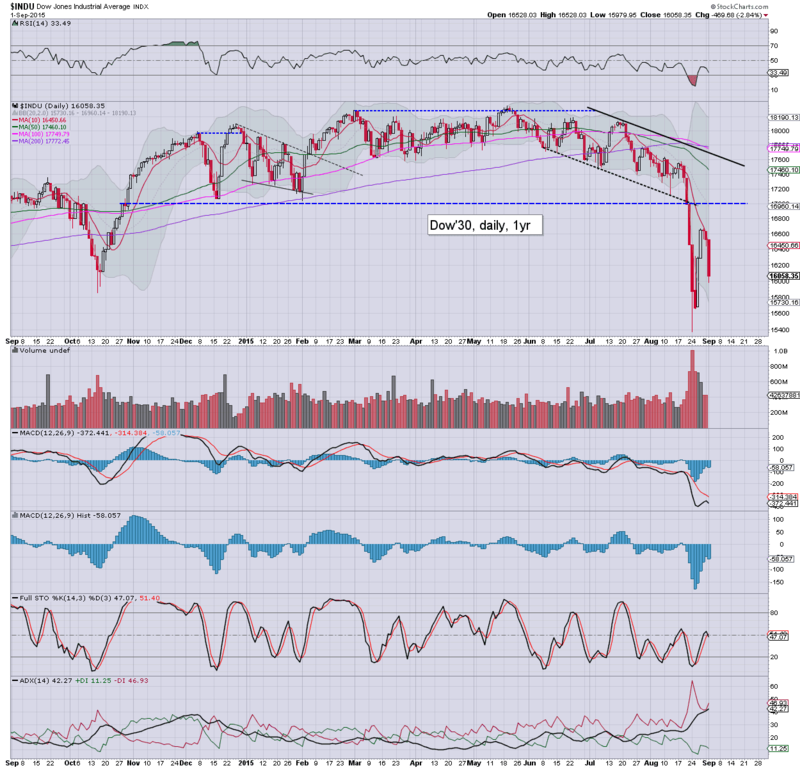 Best case downside after mid' Sept' remains the sp'1725/00 zone.. which would equate to Dow somewhere in the low 14000s. VIX would likely take out the recent high of 53s.. and max out in the 65/75 zone... which is a pretty bizarre thought after some years of waiting for sustained action in the mere 20s! Wed' will see ADP jobs, EIA oil report, factory orders, productivity/costs, and a Fed Beige book (2pm). Market will be increasingly focused on the looming Thursday ECB meeting (along with a Draghi press conf').. and the Friday jobs data. 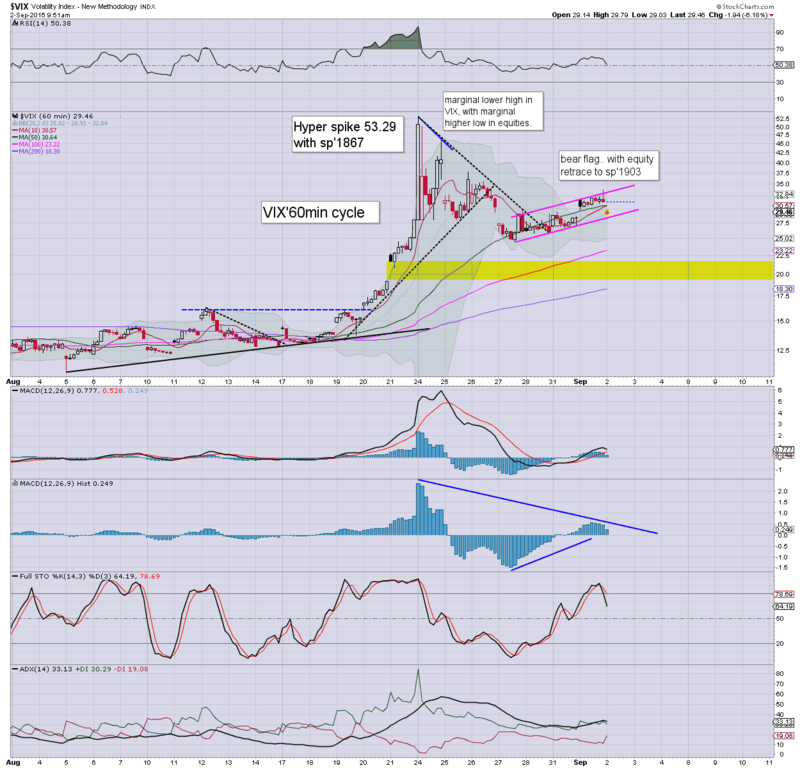 We have the second consecutive red candle on the 'rainbow' chart, something not seen since the collapse wave of 2011. There will be clear resistance at the 10MA of 2047. 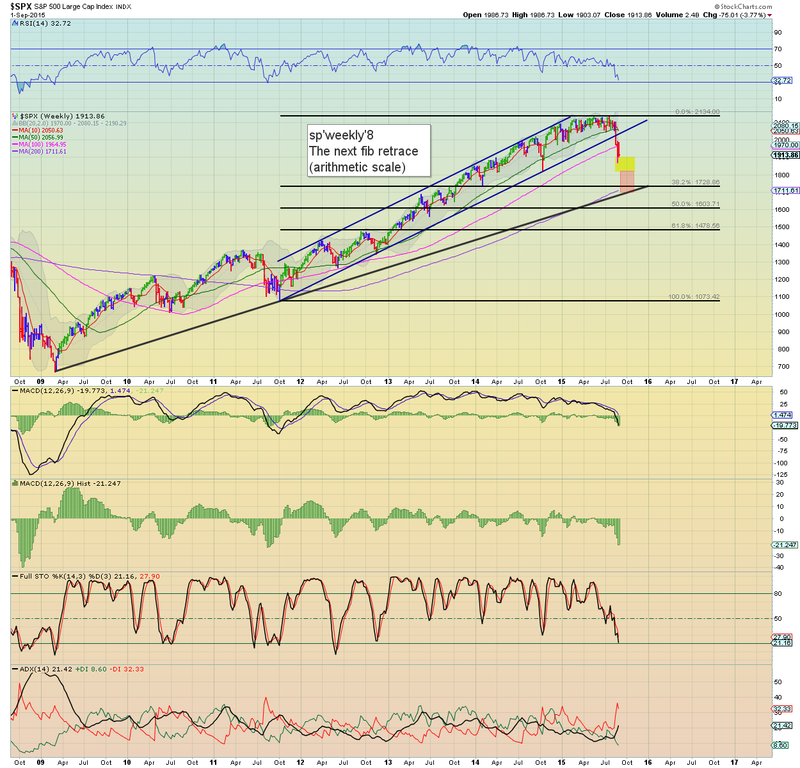 I certainly don't see sustained price action above sp'2080 for probably the rest of the year. The lower bollinger at 1838 is an obvious target for Sept/Oct'... along with the nearby Oct'2014 low of 1820. As for yours truly.. like last week, I have again been overly early on an AAPL-long, but given another 2-3 days, I should have a fair chance at exiting that at least moderately profitable before the (3 day) holiday weekend. As things are, I remain under a 'trading light' rule until mid Sept'. Once the FOMC is out of the way.. and if we're somewhere >2000, I'll go heavy short... in prep' for a crash wave to the low 1700s. It would be somewhat annoying if we're already in the crash wave itself... we shall see. Suffice to note, a second day in favour of the equity bears... but it is likely just a natural retrace of last weeks 126pt ramp of sp'1867 to 1993. 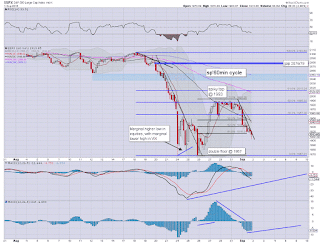 Renewed upside >sp'2000 looks probable... although I realise a fair few will disagree with that!